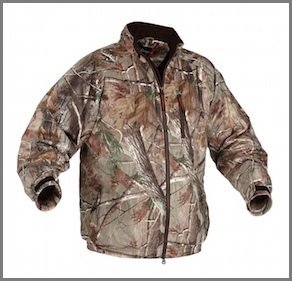 The jacket features a clean, low profile front chest so it doesn’t interfere when drawing your bow. The large capacity lower slash pockets, zippered chest pocket, zippered inner pocket and interior stuff pocket, allows you easy access to your gear. An elastic band at the waist gives you freedom of movement and the elastic cuffs with adjustable hook and loop tabs keep rain and water out. The two-way front zipper makes it convenient to add ventilation when needed or easy access to your under layers.